The position of TSEA in rega rds to the privatization of public services is fairly basic. We believe that services provided by the state for citizens of the state are best provided by state employees. There are limited areas where the contracting of services is appropriate, but those services need to be provided on a regular and consistent level. Tennessee has learned the hard way in the past that when services are contracted, the state loses its control over the delivery and quality of those services. The state does not provide services to make a profit, nor should they. But the private contractor always seeks contracts with expectation of profiting from them – that is the nature of for-profit business. When the prospect of profit goes away, so does the contractor and their services. When that happens, state employees must then go in to pick up the pieces and do the job that they should have been allowed to do all along. 1. Have these “new and efficient” methods been tried elsewhere? And if they have, what is their track record? 2. If these methods have such merit, why can the state not adopt and apply those methods to existing agencies and workers, saving the taxpayers from having to pay profit to the contractor? 3. If the contractor is planning to take over from the state and provide services similar to the way those services had been performed by state employees, wherein lies the profit? Will the contractor use fewer employees? And how long before services decay and are delayed by an overworked and inadequately staffed workforce? 4. Will the contractors use employees with lower qualifications, or reduce pay and benefits to attain profit? Will services and the citizens’ private, confidential information be outsourced to another state or country for the sake of profit? TSEA will not be satisfied until state employees are no longer forced to decide between good benefits and good pay, but this requires us to continue to work together toward that goal. The state cannot contract away its responsibilities or liability when harm is done to the citizens of Tennessee due to contractor negligence or incompetence. Tennessee has an obligation to provide services in an efficient manner, and changes to the way those services are being provided can always be formulated in a manner that does not negatively impact state employees. State employees can adapt to new methods – we do it all the time. TSEA is against the privatization of state services in any incarnation and we have a long history of fighting hard for state employees in all departments to have the opportunity to keep the careers they chose with the state. Unfortunately, privatization is a challenge state employees will continue to face into the foreseeable future. Only the legislature can put a stop to it, so the first step to preventing privatization is to elect representatives at the State level who realize the need for essential services to be provided by state employees. Additionally, we need to encourage our newly elected officials to consider and pass our proposed legislation, State Employees Not Contractors, which would require all agencies to prove that state employees cannot perform the job before a contract is let out – because you deserve a better approach. Sometimes in order to appreciate all that you have done, it is important to remember what you have been through. TSEA has successfully dealt with privatization before. Our first priority is to make sure you keep your job. Next, we must continue work to have privatization eliminated or only considered as a last resort when it can be demonstrated that state employees cannot perform the work. Do you know of contractors in your agency that are following practices that harm citizens, clients, or state employees? If so, the TSEA Contract/Privatization Committee would like to hear from you. Additionally, if contractors have been fined by the state, have had significant lawsuits filed against them, and/or if contractors are replacing state jobs we want to know about it! 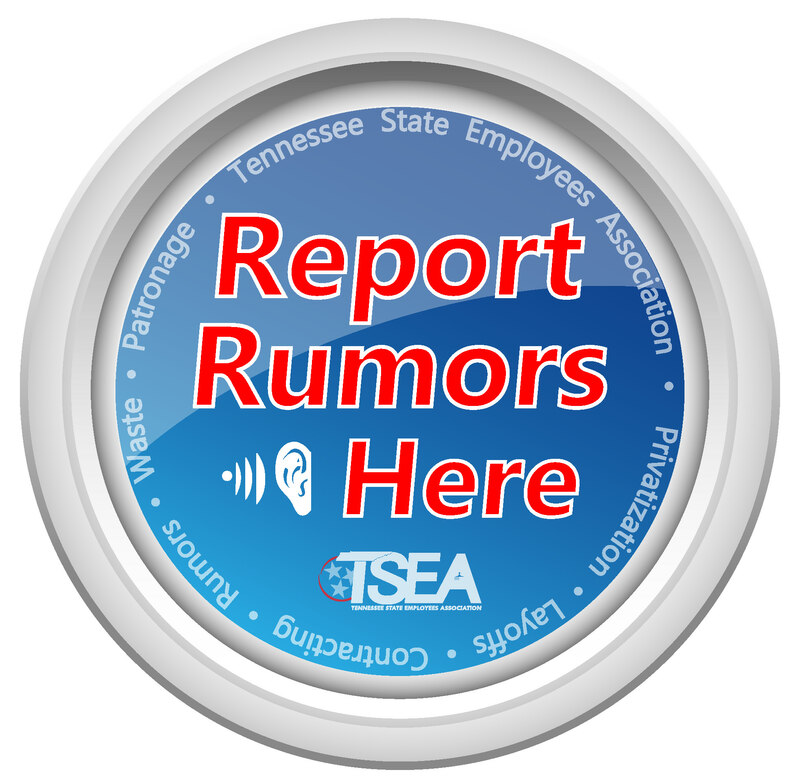 Please contact the TSEA office through the secure “Report Rumors Here” form, or by phone.